For the above in Schemes 1-30 mechanical systems, using the theorem of kinetic energy change in differential form, to determine the angular acceleration (embodiments 4, 6, 7, 9, 11, 18, 25, 26, 28) or linear acceleration (other embodiments) 1. Yarns body weightless and inextensible. 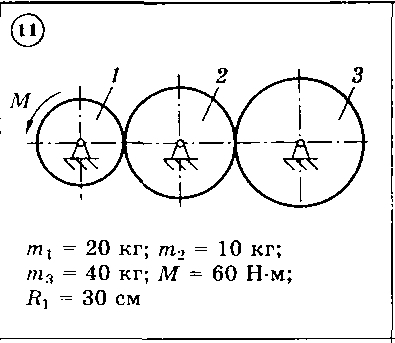 The designations: m - mass of bodies, R, r - radius, r - radius of inertia (if it is not specified, the body is regarded as a homogeneous cylinder); indicated the presence of friction f - coefficient of sliding friction, FK - friction bearings. For the above in Schemes 1-30 mechanical systems, using the theorem of kinetic energy change in the integral form, to determine the angular velocity (embodiments 4, 6, 7, 9, 11, 18, 25, 26, 28) or linear velocity (other embodiments) 1 body after a predetermined movement Fi1 = 2PI glad or S1 = 2 m. The motion starts from rest. Right after the payment you will receive a link to the archive with the decision of the two task assignments on the theoretical mechanics D3 B11 (skhema11) in the test book "theoretical mechanics" Dievskaya VA Malyshev IA 2009 for university students.